What is Snoozer Luxury Lookout II Pet Car Seat? The Snoozer Luxury Lookout II Pet Car Seat is a pet car seat that keeps your furry pal safe in the backseat while you drive. The interior is made with cozy simulated lambs wool, and the outer cover is made from elegant microsuede. It includes a connection strap that clips to your pet's harness for safety, or you can use along with the Pet Safety Harness. The Snoozer Luxury Lookout II Pet Car Seat is low enough so your pet can still see out the window, which cuts down on car sickness. As an added bonus, the Snoozer Lookout II Pet Car Seat comes with a small tray placed at the bottom of the car seat that holds pet accessories like leashes, toys, or treats. Available in small, medium, or large sizes and three color options, the Snoozer Lookout II Pet Car Seat creates a comfortable luxurious spot for your road buddy. Large size works perfectly for two small pets, and holds up to 35 lbs. 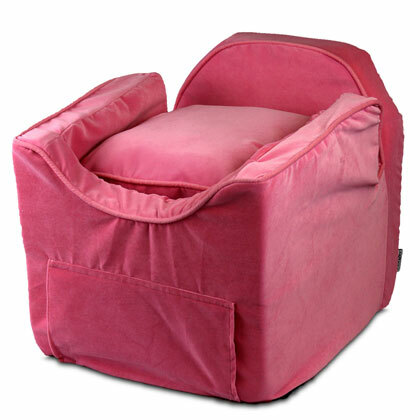 Place the Snoozer Luxury Lookout II Pet Car Seat in the back seat of your vehicle. Slip the seat belt down through the open channel on back of the Snoozer Luxury Lookout II Pet Car Seat. This secures the car seat to your vehicle. Place your pet in the car seat.